I've backed about a dozen Kickstarter projects to date. About half of them are being finalized still, but I've gotten my "loot" for the other half. 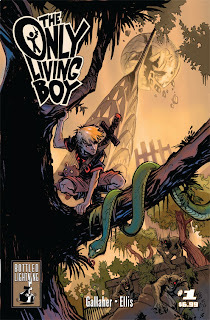 And so far, I have to say that The Only Living Boy rates as the best money I've spent on a Kickstarter so far. 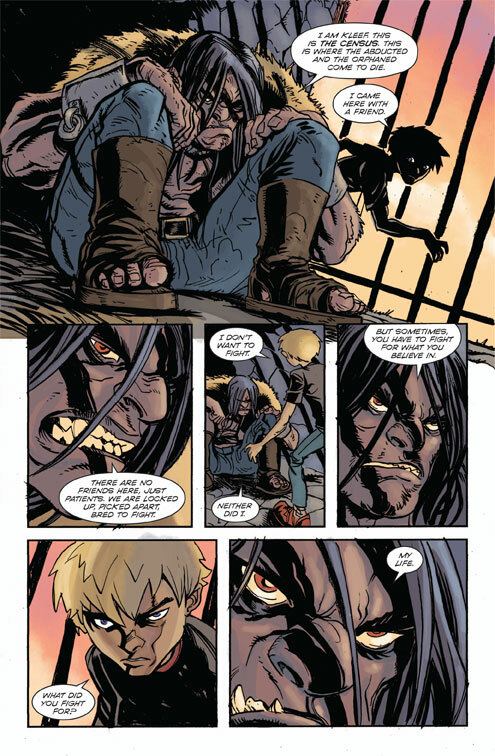 Reading this first installment, I got this mixed Kamandi/Flash Gordon vibe to things and, looking back, Gallaher notes that they were indeed inspired by the pulp adventures of the likes of John Carter, Tarzan and Flash Gordon. Only Living Boy has much of that action/adventure feel, but without many of the halting and sometimes bizarre plot twists. Erik is a different type of character from what I think most people are used to seeing from Gallaher. Largely owing to the fact that he's still a child, Erik's not nearly as experienced and/or confident as many other protagonists, so it will be interesting to see how the story plays out in that regard. Gallaher also sets up some nice character moments that are fun and entertaining as well. Ellis' work is particularly top-notch. He's proven himself a skilled illustrator and storyteller, certainly, but this is honestly some of his best work, I think. As I look more closely at it, it seems to have cleaner linework -- a different inking process maybe? In any event, it looks fantastic. This is just the first issue of four, but well worth it for 46 pages of story. If you didn't already get one ordered through their Kickstarter, they'll have both standard and variant editions at Comic-Con (Booth #2206) or you can purchase a digital copy via comiXology.